1.Heat large covered saucepot of salted water to boiling over high heat. Add pasta and cook as label directs; drain. Rinse pasta under cold water and drain. 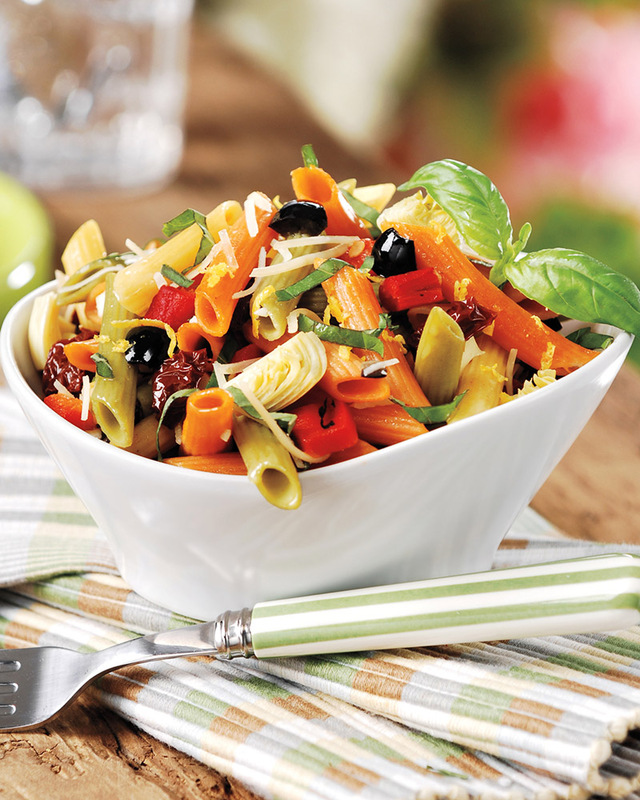 2.In large bowl, toss pasta with remaining ingredients until well blended. Cover and refrigerate at least 3 hours or up to 2 days. Serve garnished with basil. Toss in chilled cooked shrimp and serve as an entrée. To make gluten-free, substitute gluten-free pasta or make it with quinoa or polenta! This dish packs a lot of antioxidant-rich herbs and vegetables! To make it a main entrée, toss in garbanzo beans for protein. They’re a great source of iron and fiber.